The American Standard Reliant+ Single-Handle Pull-Out Sprayer Kitchen Faucet in Polished Chrome has a swivel spout that is ideal for filling tall vases and pots. The faucet features a pull-out sprayer with an adjustable spray pattern that makes it easy to clean dishes. Its nylon hose and ceramic disc valves ensure smooth operation. Also available in store by special order only see store for details. 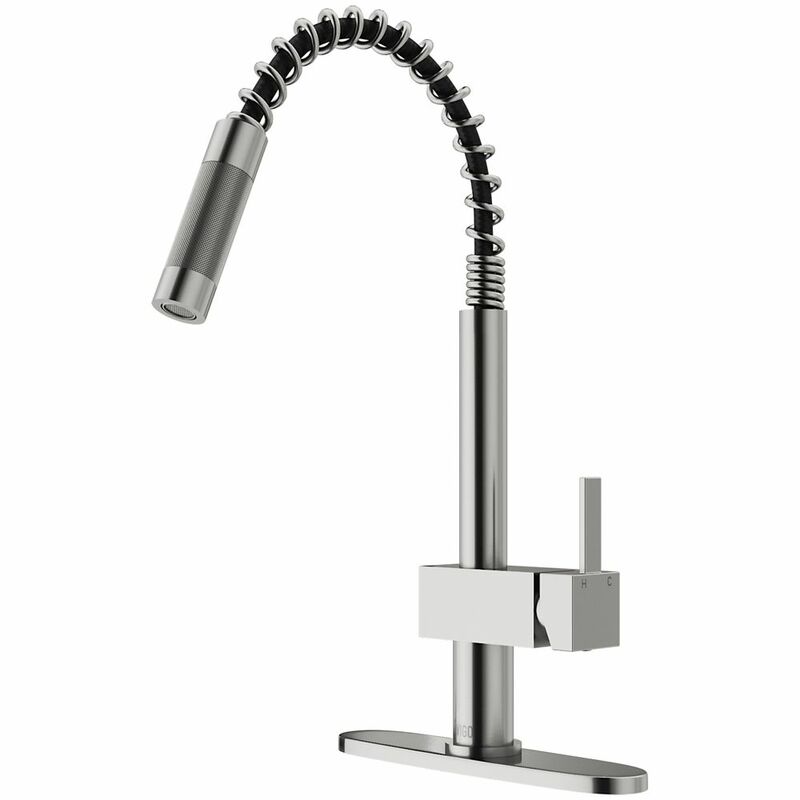 Stainless Steel Pull-Out Kitchen Faucet with Deck Plate You deserve a kitchen that reflects your personality. Why not start with this stylish and durable Vigo faucet for your sink. Stainless steel finish with matching deck plate all solid brass construction which ensures durability and longer life. Faucet features single function pull-out spray head with power spray. Includes a spray face that resists mineral buildup and is easy-to-clean. Stainless Steel Pull-Out Kitchen Faucet with Deck Plate is rated 4.4 out of 5 by 21. Rated 3 out of 5 by Todd from this product gives you very little option. On/off. ... this product gives you very little option. On/off. Hot/cold. Very simple. Rated 5 out of 5 by Sandra from Great looking product and was easy to install. I get many compliments on it. Great for filling ... Great looking product and was easy to install. I get many compliments on it. Great for filling large pots. It does not have a fine spray function but I don't miss that.